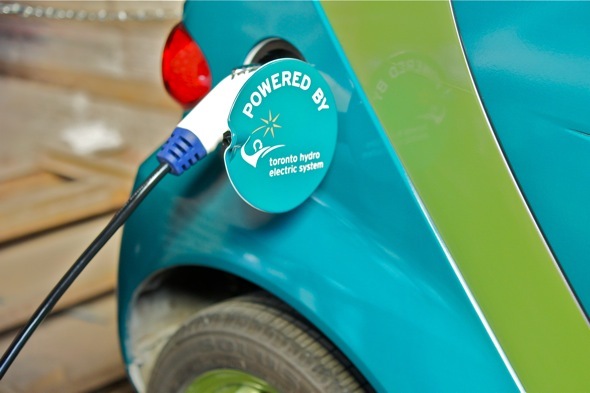 Bringing EV Fest -- Toronto's fall festival of electric cars -- to The Brick Works from last year's event held in a Toyota-Lexus dealership made sense on many levels. EV Fest 2011 showcased electric car and bike offerings in a space where nature, culture and community intersect. Held in The Kilns and Holcim Gallery on Sunday, it was neat to see such modern-day transportation options inside such the heritage property. The all-electric Tesla Roadster Sport (pictured in the lead photo) was quite the head-turner. But at over $110,000 price tag, I think I'd rather wait until their Model S comes out next year, at a mere US$57,400 estimated price. Perhaps equally as impressive, but on another level, was the pride and dedication that eco-enthusiasts applied towards converting their vehicles to running on electricity or other, more environmentally friendly options. Eco Steve showed off his '84 Fiero that he converted to electric for about $1,000 worth of recycled parts -- and countless hours of labour, no doubt. 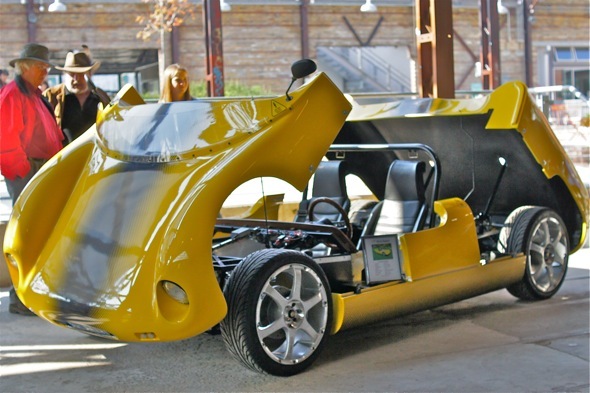 Then there was the bright yellow Z2T Electric Roadster, that Scott converted from a Suzuki Swift GTi. Tim Sheppard proudly displayed his Volkswagen TDI Beetle with 600,000 kms on it. It travels 500 km daily and has been to Saratoga Springs, NY and back using 12 gallons of waste vegetable oil. Electric motorcycles are different beasts altogether. Ed Stepanik converted a 1991 Suzuki GSX600F "Katana" which he nicknamed El-Kat (Electric Katana). At over 140 hours research and buying parts, 150 hours building and at least $10,000 conversion cost (mostly for lithium batteries, motor, motor controller and chargers) I guess you could say it's a labour of love. 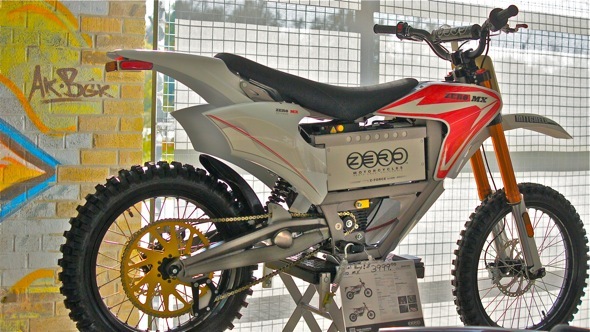 For the those who prefer to have their eco-ride fully built for them, there's Zero Motorcycles, represented at the EV Show by Mitchell Cycle in Mitchell, Ont. Tempting, but until the prices come down to something comparable to the top speed and range of their gas counterparts, I think I'll stick to my gas scooter for now. 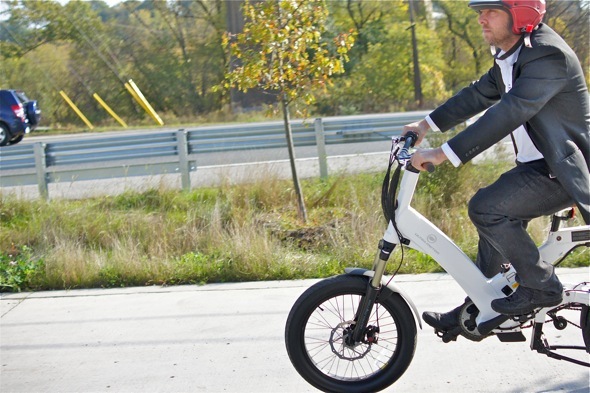 For those who prefer the pedal-assist electric bicycles, there's the sturdy Ultramotor A2B bikes, which EV Fest attendee Joshua BrassĂŠ was eager to test drive. The Brickworks is also a site for AutoShare's new EV Program, featuring the Nissan Leaf. 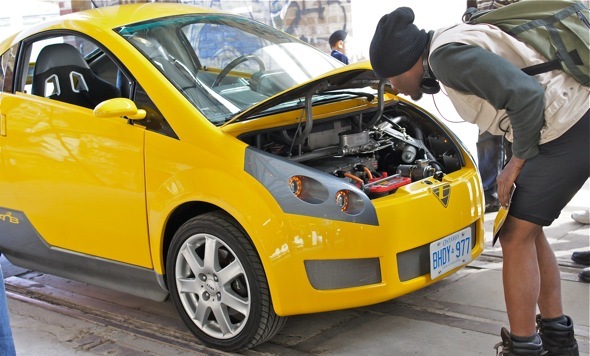 PlugNDrive was there too, as part of their cross-Ontario road show promoting EVs to businesses and drivers. 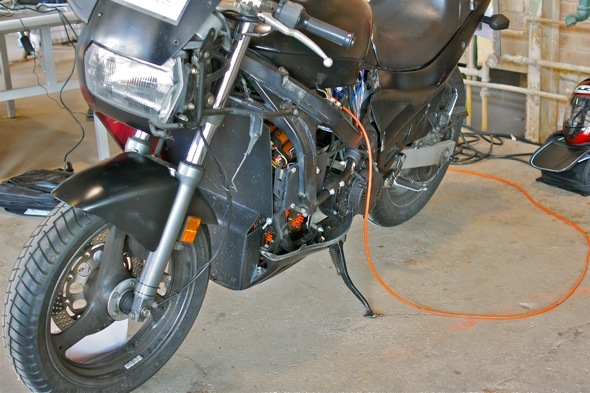 If you live in a condo and are thinking of buying or leasing an EV and you're concerned with the challenges of charging an EV, ParkPlug Power may provide some solutions. Altogether, the EV Fest was a neat glimpse into what an electric vehicle future could have in Toronto. 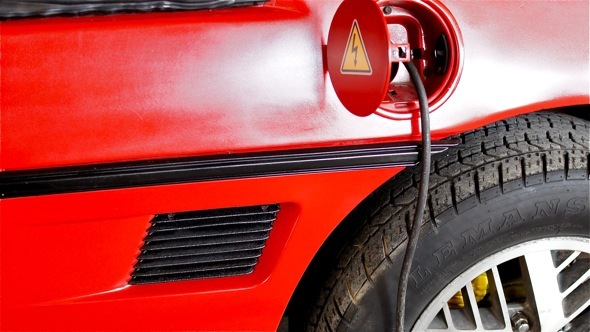 Once we get past the range anxiety, er... awareness and sticker shock over the cost-of-ownership of these fossil-fuel alternatives, we'll be well on our way to a greener transportation options and the environmental and economic benefits that they can bring.